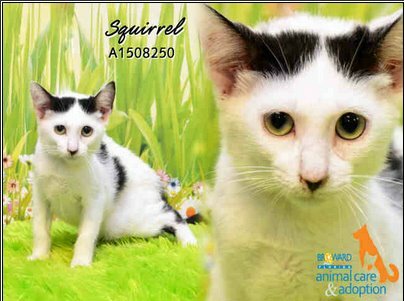 Squirrel’s shelter photo tugged at hearts and was shared thousands of times when it was posted at Facebook with the hope that her life might be saved. The heartbreakingly scared and sad looking girl was pulled from the shelter and is in temporary care waiting for her adopter to pick her up this weekend. Squirrel and her two siblings Chipmonk and Mouse were at Broward County Animal Care in Florida, a little family of 3 month old kittens who were running out of time. Squirrel is reported to be in the temporary care of Cat Crusade Adoption And Rescue Endeavor as she awaits an adoption that is planned for this Saturday. 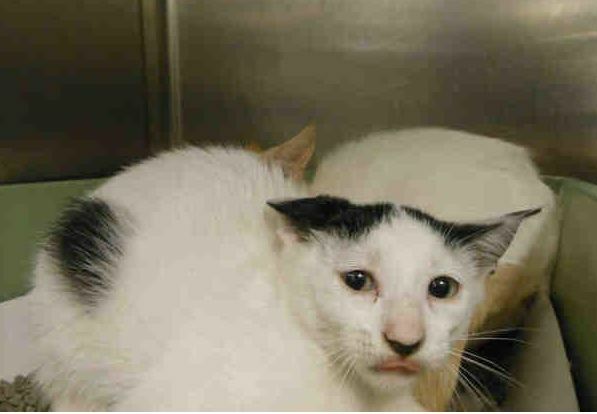 By Friday of last week, concerned people had sent money for the three cats to be pulled from Broward County Animal care, which works with rescuers. There was concern that fosters would not be found for them and they would not be pulled, but arrangements were made. Each of the three cats has found an adopter. Squirrel’s new petmom will travel from out of state to Florida this weekend to pick her up. Squirrel will be renamed Min-Yin, and her adopter has set up a Facebook page for her here so those who were touched by her haunting gaze can follow her expected transformation once she settles into her loving forever home. Squirrel’s adoption photo, taken by BCAC volunteer, Donna Curry, who makes hopeful and beautiful adoption images to try to help the shelter’s animals find homes. So happy the poor thing found a home. I wish I could just once take a pic of one of my furbabies that looks half as good as this pic looks of the poor dear. I hope her other two siblings get the help they need as well.